SAN JOSE, CA--(Marketwired - Sep 22, 2014) - Cypress Semiconductor Corp. (NASDAQ: CY), the market leader in capacitive touch-sensing solutions, today announced a promotion on a CapSense® controller for just $0.025 per button. The promotion is for the 10-button CapSense CY8CMBR3110 controller in Cypress's CY8CMBR3x mechanical button replacement (MBR) family, which enables engineers of all levels to quickly implement sleek, reliable capacitive touch-sensing user interfaces. The family provides industry-leading features, such as water tolerance and proximity sensing, without the need for coding or firmware development. The promotion will run with no restrictions on quantities and will be available for a limited time. More information on the promotion and the CapSense MBR3 family is available at: www.cypress.com/capsensepromo. The CY8CMBR3x controllers leverage Cypress's SmartSense™ Auto-tuning algorithm to completely eliminate the requirement for manual system tuning. SmartSense enables automatic tuning of more than 10 parameters to achieve optimal touch sensing performance during system, manufacturing, and environmental changes. The CY8CMBR3x family is also supported by Cypress's EZ-Click™ software tool, which combines GUI-based configuration, product debug and production-line testing with no firmware development required. "It readily adapts to variations in PCB, overlay, paint, and manufacturing that degrade touch-sensing performance. It also eliminates production-related manual tuning, adapts to changes in system environment due to noise sources, and allows a platform design approach with different overlays, button shapes, and trace lengths." "EZ-Click software is intuitive and easy to use; Great introduction to capacitive touch applications." "...CapSense switches can be used with common workshop gloves, even those with thick seams." "If you need a non-mechanical button solution, look no further!" "This 2.5 cent promotion gives designers the perfect opportunity to replace their products' unreliable mechanical buttons with CapSense MBR3," said John Weil, Vice President of Marketing for PSoC and CapSense at Cypress. "User reviews of our MBR3 solution provide excellent validation that designers can use it to quickly and easily implement a sleek capacitive-sensing user interface that will deliver top performance even in challenging environments." The CY8CMBR3x controllers are ideal for applications in a broad range of markets, including consumer, automotive, home appliance, industrial, medical and fitness. The controllers can implement up to 16 capacitive buttons or up to 8 capacitive buttons while driving 8 LEDs. Designers can leverage the devices to add up to two proximity sensors with a 30-cm sensing distance for wake-on-approach applications. Additionally, the CY8CMBR3x controllers feature Flanking Sensor Suppression (FSS) that eliminates false touches when buttons are closely spaced. Devices in the CapSense MBR family deliver robust sensing in noisy environments using Cypress's patented CapSense Sigma-Delta (CSD) sensing method, ensuring superior immunity to conducted and radiated noise with a signal-to-noise ratio of greater than 100:1. Operating from 1.71V to 5.5V, the devices are ideal for a wide range of regulated and unregulated battery applications, including single coin cell battery operation. The controllers also feature an integrated voltage regulator to address power supply noise, as well as filters for any spurious noise. Cypress has shipped more than one billion CapSense touch-sensing controllers, which have replaced over five billion mechanical buttons in mobile handsets, laptops, consumer electronics, white goods, automotive applications, and virtually any system that has a mechanical button or switch, making Cypress the industry touch-sensing leader. The CapSense portfolio, the industry's broadest and most integrated, enhances industrial design and reliability with the most noise-immune and water tolerant capacitive touch-sensing interfaces, including proximity sensing where direct touch is not required. CapSense proximity sensing can provide power savings by activating an interface only when needed while further enhancing industrial designs by only exposing interfaces when necessary. Learn more about CapSense online at www.cypress.com/go/capsense. Visit us on Facebook and LinkedIn. Cypress delivers high-performance, mixed-signal, programmable solutions that provide customers with rapid time-to-market and exceptional system value. Cypress offerings include the flagship PSoC® 1, PSoC 3, PSoC 4 and PSoC 5LP programmable system-on-chip families. Cypress is the world leader in capacitive user interface solutions including CapSense touch sensing, TrueTouch touchscreens, and trackpad solutions for notebook PCs and peripherals. Cypress is a world leader in USB controllers, which enhance connectivity and performance in a wide range of consumer and industrial products. 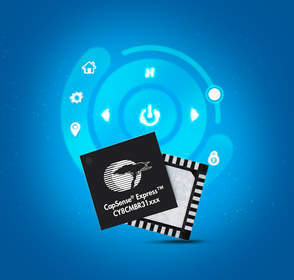 Cypress is also the world leader in SRAM and nonvolatile RAM memories. Cypress serves numerous major markets, including consumer, mobile handsets, computation, data communications, automotive, industrial and military. Cypress trades on the NASDAQ Global Select Market under the ticker symbol CY. Visit Cypress online at www.cypress.com. Cypress, the Cypress logo, TrueTouch, PSoC, and CapSense are registered trademarks and SmartSense and EZ-Click are trademarks of Cypress Semiconductor Corp. All other trademarks are property of their owners. About this company Cypress Semiconductor Corp.
Cypress’ CY8CMBR3x mechanical button replacement (MBR) family enables engineers of all levels to quickly implement sleek, reliable capacitive touch-sensing user interfaces. The family provides industry-leading features, such as water tolerance and proximity sensing, without the need for coding or firmware development. This video introduces the Cypress CapSense MBR3 family, the world's easiest capacitive-sensing solution that allows you the design with the click of a mouse using our GUI-based software tool, EZ-Click. CapSense MBR3 combines the best of CapSense features including SmartSense Auto-Tuning, robust water tolerance and best-in-class proximity sensing while delivering reliable performance under all conditions.